I'd like to take this opportunity to introduce you to Homeless Gwen, the newest American Girl Doll. For a mere $95 dollars you too can have Gwen. Or for $175 you can have Homeless Gwen and her friend Rich Chrissa. 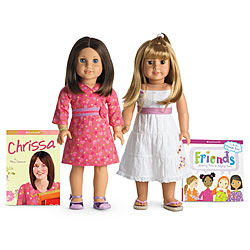 Apparently, in American Girl Doll Land - Chrissa stands up for Homeless Gwen when she's bullied by classmates. And for that Homeless Gwen deserves to be a doll. I must say, I think I like Homeless Gwen's outfit better than Rich Chrissa. 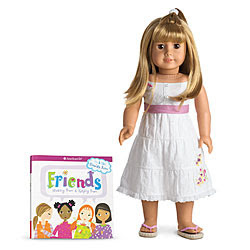 But what really baffles me is who American Girl is marketing this doll? Would a CEO who just lost his job purchase Homeless Gwen to break the news to his daughter? I'm thinking that must be it, because anyone else with financial troubles wouldn't be able to pony up $95 for a doll. Also, who came up with this bright idea? Did American Girl give their people 10 minutes to come up with the next doll? And even if that was the case, they couldn't come up with anything better? How about College-Bound Christine? Or Broken Leg Betty? Of how about donating the profits from Homeless Gwen to homeless shelter? But no, instead of any other ideas, if they were even any other ideas, they chose Homeless Gwen, the most expensive homeless accessory. what about crackhead barbie or ken......... the first doll is free after that they are $100 each! ?